He was a ball playing centre-half forward as a player who admits he would have had problems with the modern game yet Damian McErlain is a man revolutionising Derry county football from the inside. He won’t like that description. The limelight is not his natural habitat but such has been the impact of the Magherafelt man that he can no longer escape the spotlight. Success brings that focus and it will only increase if he helps mastermind the retention of the Fr. Murray Cup against Donegal on Sunday. Twelve months ago Derry minor football was at a low ebb. Thirteen years without an Ulster title and a succession of early exits meant expectations were rock bottom. They hardly improved with a semi-final draw against a Donegal team most had already decided were All Ireland champions in waiting. Fast forward a few weeks and McErlain’s team were soaking up the adulation of the Clones crowd after defeating Cavan in the final but it was that victory over Donegal that seemed to bring the Oak Leaf epiphany. Strange then that Derry will once again assume the mantle of underdogs this weekend but McErlain is not one to worry about pre-match predictions or tags. “There is no doubt Donegal will be looking to use last year’s result. I have no problem with that, I would be doing exactly the same if it was on this side. From our point of view, It’s two different groups and for Donegal it’s same. I think they have only four from last year’s panel. “Those four may be thinking they have a score to settle but once a ball is thrown in, how much can that really matter? Those strengths are considerable, as a chastening 3-12 to 0-6 league defeat this year testifies but McErlain has refreshing frankness when dealing with games and how players should approach playing for the county. “It is the communication right from they walk in the door. Straight away they are getting the message, ‘This is different’. I have been telling them since we first got together, it is not the ‘15 best’ but the ‘best 15’ I will pick. It is a remarkably similar scenario to last season. A less than impressive league campaign followed by Championship displays that have improved game by game. The defeat of Tyrone at Celtic Park was notable for the manner in which the Oak Leafers controlled the game and followed a game-plan that worked to a tee. The extra-time semi-final victory against Armagh was more a test of character and as much to do with the spirit McErlain has instilled in the group as ability. Both games highlighted a strength in depth in the Derry panel which will be crucial. Swatragh’s Lorcan McWilliams is struggling to be fit for the final but Caolin Devlin, Seamu Higgins and others have proved their worth off the bench and Sunday’s game is likely to be won by 21 rather than 15. There will be no surprises about the threat Donegal carry. Sean Paul Barrett may have taken over from Declan Bonner but the Tir Conaill conveyor belt is still producing talent. Centre-half forward Niall O’Donnell is the minor version of Michael Murphy in terms of scoring potential. Eoghan McGettigan is another formidable forward while the Donegal midfield of Jason McGee and Kieran Gallagher is one of the biggest in the country. “Donegal are probably not under the same pressure as last year,” adds McErlain, “The hype they received last year was serious but merited at the same time because they were a class side. They are going to be immense at under 21 level over the next few years. That continuity of approach is something fascinates McErlain. “When Jim McGuinness came in he really transformed the style but they have evolved at senior level. They are an attacking team now and at minor level they are a serious attacking force as well. There is a Donegal way and maybe Derry don’t have the uniformity across all age levels but we are making great strides about getting continuity. “That’s difficult and maybe they approach the whole thing differently. Maybe they look for a type of player first because they know the type of game they want to play. They don’t pick the best club players because they are the best club players, they pick players because they know they are going to cope in the county game - athletes. 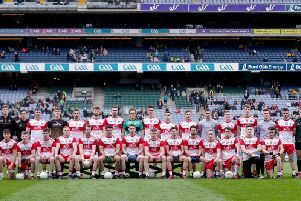 “I think it is fairly well known that in Tyrone there is any amount of tall, quality midfielders ; class player who can take scores, catch ball and move it but if they cant go 21 to 21 they don’t get selected because Mickey (Harte) he has the authority and gets away with doing that as they are building strong teams all the time. That is the reality. “That is how I would see county and club football. They are like two different sports. You are almost looking for the athlete before the footballer and that’s sad in a way. It certainly wouldn’t have suited me as a footballer. “From an early age now fellas know now where they are at and what they have to do to play county football. Now, what you have to do and how you want to play is a whole different subject. There are some huge sacrifices made and you’re whole life has to revolve around it but our players have has worked unbelievably hard. That effort and resilience will be needed more than ever on Sunday. Last year’s meeting went down to the last kick and this could do likewise but McErlain has confidence in his players. “You have to be organised. If you don’t have a system and are beat in the championship you will be a ‘lamb to the slaughter’ but at the same time the skills have to be right. The teams that do the basic skill best and take their chances will win.